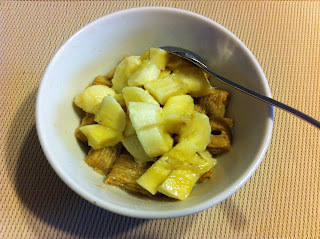 Becoming Ariela: my weight loss "secret"
Breakfast of overnight-soaked Quaker's Oatmeal Squares in milk, and a banana. 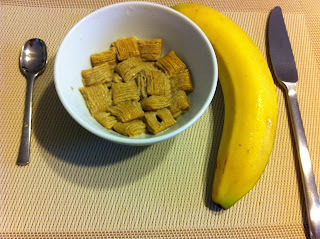 Except I only ate half that banana. Nothing much these days except the norm. Eating soft foods, worrying about caloric intake, having people comment about my weight, realizing I have to go shopping soon for new clothes. I guess to some extent I have lost quite a bit... About 5 kilos (~11pounds) in a month or so. But honestly, it wasn't that difficult. Stop eating once 5pm hits. Fast and Pray. Have a good reason, or this won't stick. Have a general tendency to prefer vegetables to meats anytime. Wholegrain over whites, always. Apart from a chocolate weakness, I am actually quite the health/nutrition freak. Get braces. It REALLY limits your food intake. I literally went as far as touching some chips in a bag of kettle chips the other day till I realized how hard and probably inedible with braces they were... and how painful and unpleasant that experience would be. Immediate junk food craving-killer. Sign up for a marathon that requires you to walk/jog at least 3-4 times a week. Good luck with Number 1.